Our Little Inspirations: Halloween EEEK! I'm starting my Halloween cards now, because the calendar shows that it's just around the corner. Today's card includes a Memory Box Creepy Spider, as well as an Impression Obsession ghost colored with a fluorescent FV2 Copic. The sentiment was done with my Quickutz, using cardstock colored with an FY1 fluorescent Copic. The orange banner was done with a SU! embossing folder, and the spider's eyes were made with a white Sharpie. The bat dsp is by Bazzill Basics, and the card base was stamped with white ink using a stick stamp by Judith. 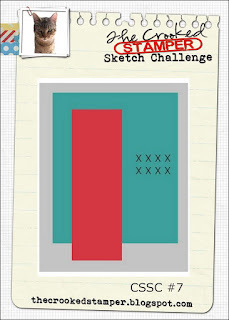 I based my card on the CSSC#7 sketch challenge, so I'm heading over there to link up. EEEEK!!! I am not mentally ready for the holidays! However, I'm not sure I've seen anyone admit to using their florescent Copics, so bonus points there. I don't think I'e ever used mine. Thanks for playing my CS Sketch Challenge! This year has just flown by and Halloween will be here so soon, it's scary!!! Great card all the way around. Enjoy the day. A brilliant Halloween card Carol, lots of fabulous details. Great card! I saw it at the challenge linkin. Halloween is indeed coming and I too am thinking about cards and all things H'weenish. I love the look on that ghost's face, he looks quite horrified at the spired that is bigger than he is (and rightfully so). EEEK! indeed! Eeek is right!!! So hard to think of it almost being Halloween with 103 temps outside. It will be here soon though and love this fun card. The fluorescent markers just let it shine too. Precious! Brrrr!!! What a fear! I'm scared from this fat spider and the fluo ghost!! 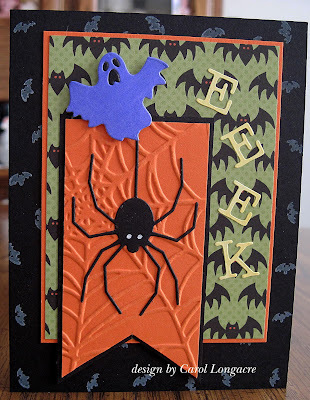 :) This card is really perfect for Halloween!! Great work!! I love the way my friends over the pond celebrate Hallowe'en . . . us Brits just don't "do" Hallowe'en and have little or no call for this type of card. However, I DO love this fiendish make! I know Halloween is getting close, we are putting the "stuff" out at work, but I am just not ready! Tis is spooky sweet! I need to borrow your ghosties.